Ohh the motto of the all-famous King. If there is one thing that I always associate with fast food chains, it is their motto. I Know When It’s Real as I cruise into Wendy’s just as I know that I am going to certainly Have It My Way as I shimmy my way into the BK. Not that I do so all that often but it is pretty fun to say. And if BK is telling me to go ahead and mix it up, why not do so. We were driving through Ft. Myers last weekend and decided to make a late afternoon stop at the BK to see our cousin who works there. He had no idea we were stopping in and let me tell you, he was surprised. We decided to order just a snack and all share it. We opted for a Small Fry and a Small Onion Rings. 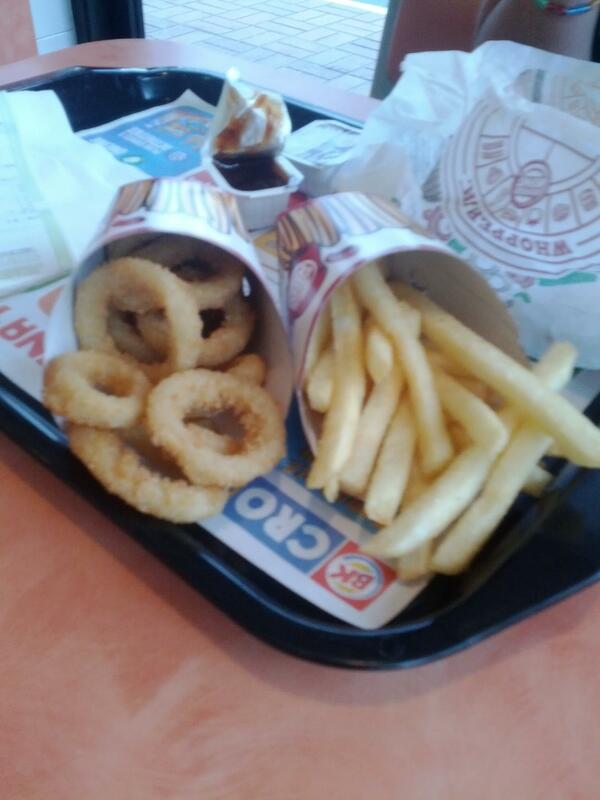 This is certainly something that sets Burger King apart – the onion rings. While other chains do offer onion rings, I think that BK is the most relevant one to do so. Plus, they allow you to interchange the fries and onion rings with no additional charge. As I mentioned, I really don’t visit Burger King too often. Burger King changed their fries a few months back and this is just the second time I have had them. The fries were room temperature when we received them which was kinda a bummer. Even though I don’t love super-hot fries, I do like them when they are hot, crisp & fresh. I really enjoyed BK’s old fries and I cannot say the same for the new ones. While the taste is somewhat similar, the new size & consistency of the fries totally ruins it for me. The new fries are thicker cut which produces a wider fry. Unfortunately, it also produces a fry that is very starchy and thick in consistency. BK does not master a faux steak fry in this case at all. Rather, it masters a fry that takes a while to chew and leaves an unpleasant after taste. I powered my way through a few fries and was able to eat them but, really have no desire to have them again. Maybe if they were warmer they would have been better. The taste was kinda sorta like the old fries but the starchiness just killed it for me. On the other hand, the onion rings were a whole lot better than I recall. I have no idea when the last time was that I had BK’s onion rings, but the thought that they were mushy and fake tasting was stuck in my head. Well, this was not the case with these rings. No, they weren’t the best onion rings ever however, considering it was BK, they were pretty darn good. The onion rings were pretty small in size but all had an equal amount of seasoning and coating. They were much hotter than the fries yet still not extremely hot. I asked for a BBQ Sauce to accompany the onion rings which it did quite nicely. The bbq sauce was semi-sweet and paired nicely with the onion rings. The onion rings were nice and crispy and had a taste of real onions – nothing fake, mushy or overly sweet as I had remembered. I really liked the fact that the coating was very crunchy – it made the overall taste of the rings go up. The next time I shimmy my way into the BK, I think I will most certainly avoid the fries. Now that I have come to realize that their onion rings are pretty good, why not have it my way and switch it up. New fries may be pleasing to some but I just really would like the old ones back…they were just so good. I am glad I tried the onion rings again and even more glad that they were tasty and a perfect little afternoon snack. And remember, next time you wish to mix it up, shimmy into your nearest Burger King and Have It Your Way.